If you ask anyone what the typical thing to use Rice Krispie Cereal for is, I'm willing to bet they'll say Rice Krispie treats. Do people even still eat the cereal by itself? It seems to have just become a standard that you have to make the little marshmallow-y, gooey, dessert when you buy the cereal box. That's what I did months ago when I picked one up at the store. I thought it would be fun to make a batch with my son and I was right about the preparing part. The eating part, however, was a different story. I thought he would love them and I would be the coolest mom because we just made the ultimate kid treat. Well, he ate about half of one and then the rest sat there for days without anyone but my husband eating them. And that's only because I made him because I don't like to throw away perfectly good food. Rice Krispie treats that have been sitting out for over a week? Well, those quickly became past their prime. I still had half a box of cereal left after the Rice Krispie treat adventure so I now had a challenge. What should I do with the left overs that wouldn't involve a marshmallow? I happened to glance over at a bag of dried cranberries and the idea was set. 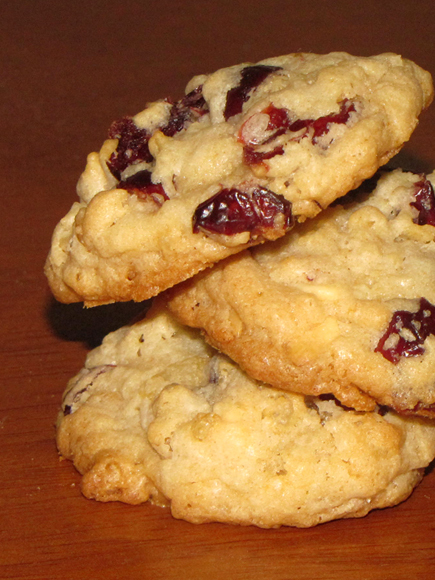 A cookie with krispies and cranberries? Perfect! 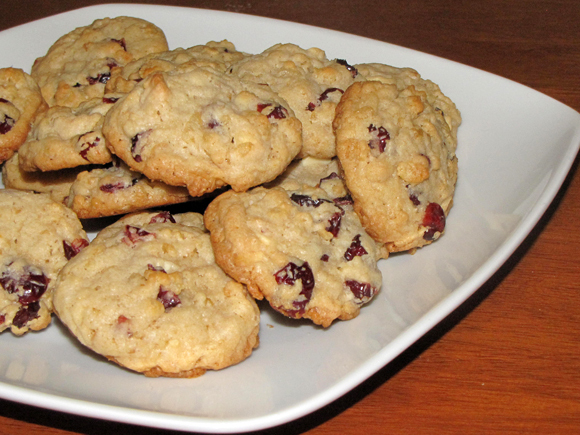 I then remembered that I had some white chocolate chips and thought those would mix well with the rest to produce a sweet treat that my son (and even my husband who hates cranberries) loved! 3. Add egg and vanilla to sugar. Beat to combine. 4. In a separate bowl, mix flour, baking powder, soda, and salt together. 5. Add flour to butter mixture in batches, combining each batch before adding the next. Scrape sides of bowl as needed. 6. Stir in cranberries, krispies and chips. 7. Lightly spray a foil-lined baking sheet with non-stick spray. 8. Drop by tablespoons onto the sheet leaving about two inches between each one. 9. Bake for 10-12 minutes or until starting to brown. I tried to count how many this made but they were disappearing too fast. I'd say there were about 30, give or take a few.